For me 2017 was still a challenging year – I wasn’t sure I’d still be doing the whole writing thing – but nowhere near as awful as 2016. Starting 2018 with good friends and a positive outlook. Plus champers. 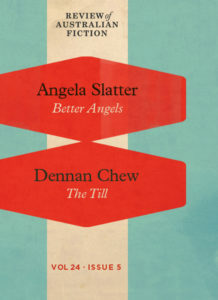 And here it is,the latest Review of Australian Fiction, with stories from yours truly and Mr Dennan Chew.